This 45.52 carat Diamond is the world's largest Deep Blue Diamond. Not only does its size makes it famous, but its legends and controversies also make it quite well-known throughout the world. Originally mined from the famous Golconda Diamond Mines situated in the Southern India, it is believed that it once adorned a Hindu deity idol before being stolen. Over the period of time, it changed many hands, with some of these including King Louis XIV and Marie Antoinette, Britain's King George IV and Henry Thomas Hope, who gave this diamond its popular nomenclature. As for the legends, it is believed that this cursed diamond wrecks havoc on the lives of its owners and also to those who are related to them. Over three centuries, numerous deaths, suicides and accidents have mired this stunning creation of nature. It is being said that one who has a pure heart can only escape from its curse, that is, one who does not try to buy or steal this diamond would lead a better life. 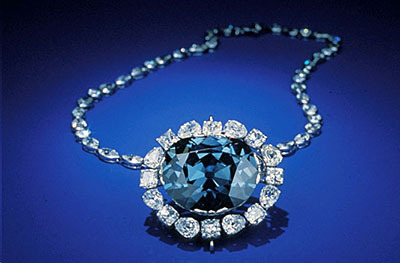 So, now the curse's effect is believed to be over after jeweler Harry Winston donated the Hope Diamond to the Smithsonian Institution in 1958, where it is still at the display for one and all. Probably one of the newest entrants to the lists of popular gemstones, this is from one of the South African mines of Diamond. Enlisted as a 24.78 carat 'Fancy Intense Pink' Diamond, this has been classified as the highest rated pink diamond by the Gemological Institute of America. Today this US $46 million is one of the most expensive single jewels ever sold at auction, being bought by the famous diamond dealer Laurence Graff, of Graff Diamonds. It was he who named this beauty after himself, after it has remained unnamed for all these years. Again from the house of Graff Diamonds, this 31.06 carats deep blue diamond has been graded higher than the Hope Diamond as the fancy deep blue diamond having flawless internal clarity. 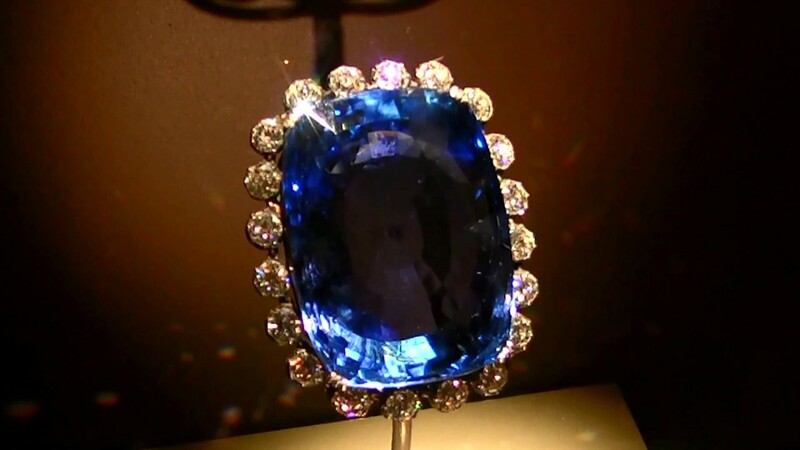 Originally mined from the Kollur Mines of Guntur in Southern India, Phillip IV of Spain owned it and presented it to his daughter Margeret as one of the dowry gifts. Over the later years, it got into the hands of the Wittelsbach Family which gave this diamond its name. In the year 2008, Graff Diamonds acquired this beauty and re-cut it against the wishes of several industry leaders. However, courtesy to this bold step, the original weight of this diamond got reduced to its present weight, but its colour grade was raised from ‘fancy deep grayish blue’ to the highest grade of ‘fancy deep blue’ to everybody’s amazement. In terms of clarity, it got revised upward from ‘very slightly included’ to ‘internally flawless’, which is the most sought after. Today, the emir of Qatar, Sheikh Hamad bin Khalifa is the owner of this diamond after spending US $80 million on its purchase. 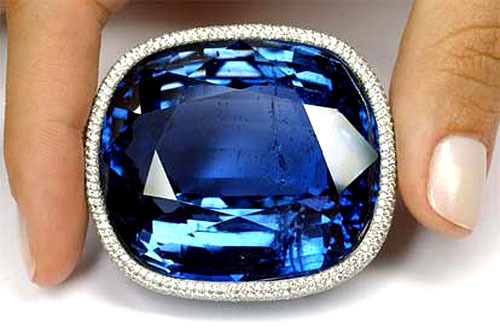 This Sri Lankan Blue Sapphire is the largest faceted blue sapphire in the world, weighs a whopping 486.52 carats. Mined in the year 1907, it was bought by an American collector. It was only in the year 2004 that it was available at Christie's for public auction. Initially, its crude version, when mined, weighed somewhere around 600 carats. The local gem cutter gave it a brilliant cut which has led this Ceylonese Sapphire gemstone to be documented as the largest faceted Sapphire in the world. Any mention of Sapphires is incomplete till we come to the famous Logan Sapphire. Another beauty from the mines of Sri Lanka, this second largest blue sapphire stands at 422.99 carats. Named after Mrs. John Logan, she was the last private owner of this fabulous gemstone before donating it to the Smithsonian Institution in 1960. Today, it is put to display at the National Museum of Natural History in Washington, D.C., set in a brooch along with 20 round brilliant cut diamonds. This green Emerald cut tablet is one of the largest known emeralds in the world. Weighing 217.80 carats, this Emerald gemstone dates back to the year 1695. So, it is possible that this Colombian Emerald was mined prior to this period. This large gemstone is engraved with Islamic prayers at one side while the other one is adorned with beautiful flower engravings. Today it is at the display at the Museum of Islamic Art, Doha, Qatar, after it was acquired from the Christie's at the US $2.2 Million. As per the Hindu scriptures, this gemstone's history dates back at least by 5000 years, however, proper documentation can be found from the year 1526 when the Mughal king Babur laid his hands over it. From then on, many wars have been fought over this 106 carat diamond which now ultimately rests with the Crown Jewels at the Tower of London. The today's Koh-i-Noor was actually a 186 carat Diamond which was commissioned to be cut by Prince Edward in order to enhance its brightness. Even today, this diamond is being strongly contested for by the Indian Government to be returned. Another marvel from the Paritala-Kollur Mine in Andhra Pradesh, India, this 182 carats pale-pink gemstone is one of the rarest to be found among the diamonds. It is from the same mine that we got the most famous Koh-i-Noor Diamond from. Also, it is believed that this brilliant Daria-i-Noor once adorned the Peacock Throne of the Mughals along with its counterpart Koh-i-Noor. In 1739, Emperor Nader Shah looted almost the entire Mughal treasury and took them back to Iran where the most of it still remains. 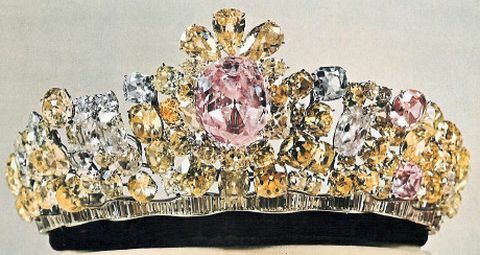 Today, the Daria-i-Noor appears in a much smaller size of the original pink diamond which was once part of the Mughal Jewels, as another 60 carats Noor-ul-Ain diamond has been carved out of it. Both these diamonds are a part of the Iranian Imperial Collection. While this list can only go on and on as Earth has produced such marvelous gemstones since time immemorial. Coveted for their extraordinary beauty, Vedic Astrology believes in their cosmic capabilities as well. Astrological Gemstone has always bestowed us with its positive influences by reducing the malefic effects of various ruling planets. It does not come as a surprise that these marvelous gemstones have always been an integral part of our Indian culture. At GemPundit, we bring to you an exclusive range of unheated and untreated Astrological Gemstones at the best value of money rates. Request A Call Back or Chat with us today for more information.